This entry was posted on Thursday, November 27th, 2014 by Frances Ryan. Today is Paul’s birthday and I am a mess. No matter how many steps I take forward, there are some moments in time that send me sliding back to the raw grief I felt in those early weeks and months. Birthdays and anniversaries are a couple of the major culprits. Only this birthday has been even harder than the last couple, and in the days leading up to today I’ve been feeling the pain a little bit more. Maybe it’s because I’m stressed out about my PhD review when I get home. Maybe it’s because I’m in the Homeland and there are stresses here because of the unsettled feelings of “home”. Maybe it’s because this year is also Thanksgiving—like the last birthday Paul had on Earth. Maybe it’s just because emotions are funny little beasts that like to remind you that they’re rather powerful. Tragically, however, maybe it’s because one of Paul’s dearest friends went to join him two days ago after a traffic accident. The news has shaken me to the core as Murray had become such a dear and treasured friend to me after Paul died. When I first joined the Widowhood Club, I was told it got easier as time went by; I was told I’d learn how to cope and that, eventually, I’d get the hang of it all. I was also told that there might be upsetting moments for the rest of my life, but that even those moments would soften. But it’s Thanksgiving, so I’m trying to be thankful. I’m trying to remember the wonderful years I had with Paul, the blessings I received from my friendship with Murray; the amazing family and friends I have around the world who are there to support me. I’m also trying to remember all of the positive things I have now or that are waiting for me in the future: New relationships; new adventures; new opportunities; and even new degrees! Photo credits: Copyright Chris McKenna. 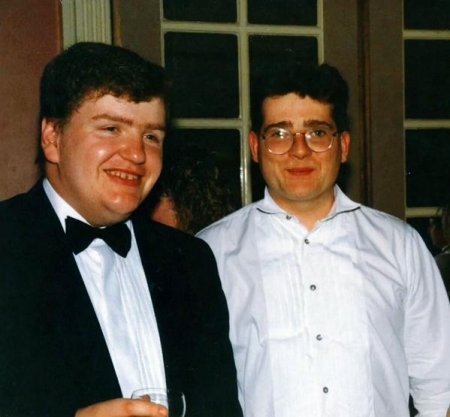 Murray Simpson and Paul Ryan, c. 1988, Teviot Union, Edinburgh University. You are in my thoughts as you go through these feelings. I am so sorry for your loss of your dear friend. You are in my prayers always. Grief is a personal journey, it is your journey, others may offer advice, some good, some not so good. Remember you are loved. I was aware of the significance of Thanksgiving this year. My greeting was brief as there are no words sufficient to express how we both feel about Paul. I am sure that the Cooks, like the Ryans were raised to share, and you are so generous with your gifts. So, you know where I am, come and see some hills.